About 6-7 years ago I was in church as the congregation was standing and singing. I was standing too, singing, eyes closed, and had my arms raised in worship. 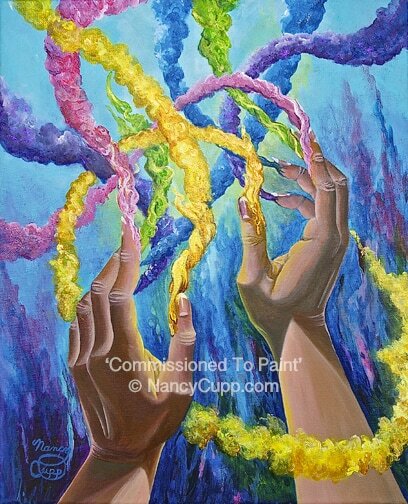 I was waving my arms slowly, when suddenly I saw in my mind many colors shooting forth from my fingertips. The colors were filling the atmosphere and moving around in the air as I moved my hands. There was healing in the colors and great power. After I saw that in my mind, I wondered what it meant. A year or two went by and one day, I got the courage to ask my pastor if I could start painting during church. He surprised me and gave me permission. One day I decided to paint what I had seen in that vision a few years earlier. Yesterday I looked up the definition of commissioned and it means "the act of entrusting a person or group with supervisory power or authority". Today, I was reading the Bible and came across this verse that I had never thought of in this way before. "His radiance is like the sunlight; He has rays flashing from His hand, And there is the hiding of His power." I was flabbergasted. The prophet Habakkuk had a similar vision of God having rays flashing from his hands too and His power was hidden in it. Wow! When God calls you, you better pay attention! It took me years to realize that the talents I had, were His gifts to me and I better use them for His glory. Talents are not just something fun to play with. It is our solemn duty to use them for His kingdom. What has God gifted you with? Whatever is easy for you and you are naturally good at, that is your gift. You may not recognize it right away, because it seems so easy for you. You may think everyone can do it. But God gave it to YOU, not to hide, but, to use as your way to reach and touch the lives of others. Don’t hide it. Get it out. Polish it off, get better at it, and share it with others. It could save someone’s life. Literally.